Every once in awhile, a children's book comes along that whisks you away to another world--and if you're very lucky, at the end of the story, it's one that also illuminates your own. Liesl & Po extends a delightful invitation to wizardry and adventure, but it’s also a gentle and poignant rumination on love and loss. Liesl has been locked away in her stepmother’s attic for a very long time, ever since her beloved father got sick. One night, a pensive ghost named Po appears in her room and lifts the veil between the everyday world and the one Beyond. What follows is a wonderful journey overflowing with heart and hope and humor. 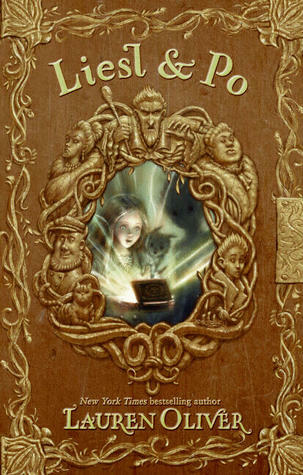 I was thoroughly charmed by Liesl, whose plucky courage and ingenuity are matched by the thoughtful, drifting Po and the hopelessly smitten Will, a young alchemist’s apprentice who accidentally sets off a troublesome chain of events when he misplaces a box full of magic. The trio is joined by an unforgettably madcap cast of characters, each with their own identities and worries and dreams, and the author deftly weaves all their interconnected threads together into a story that feels fresh and funny and thoroughly original. Not at all as mannered or as self-conscious as Breadcrumbs, which ultimately showed its seams perhaps a little too much, this fairy tale adventure is tripping with charm and written with exceptional intelligence and sensitivity. The author’s note indicates that the book was written in just two months following the sudden death of her best friend, and the extraordinary love behind that inspiration hovers wistfully over every page. ...he had imagined it perfectly: how he would come around the corner and see that tiny square of light so many stories above him, and see her face floating there like a single star. He might have begun to blur, letting the infinity tug on him gently from all sides, like sand being pulled by an eternal tide. He might have already begun the process of becoming a part of Everything. He would begin to feel the electricity from distant stars pulsing through him like a heartbeat. He would feel the weight of old planets on his shoulders, and he would feel the winds of distant corners of the universe blowing through him. My heart swells with ineffable love for this book, which has instantly found its place beside classics such as Peter Pan and The Secret Garden--and yes, it really is that good. Between the dizzying adventures and the sly cleverness of the writing and the quiet emotion, Liesl & Po reminded me especially of Mary Poppins in a huge way—particularly in the moments when you catch a fleeting glimpse of something bigger than your own story and your own self. If there’s a child in your life or a child in your heart who still longs for shining adventure, Liesl & Po will take her there. It’s beautiful. It’s transformative. It’s magic. I'd highly recommend obtaining the hardcover of this book if you can. The cover is gorgeous (click on it to enlarge and see for yourself!) and there are wonderfully simple pencil drawings throughout, some of which can be seen on the author's website here. It will make a spectacular gift for the right person for the holidays. Mwark. Sign into Goodreads to see if any of your friends have read Liesl & Po. “She liked the word ineffable because it meant a feeling so big or vast that it could not be expressed in words. “(I)f you do not believe that hearts can bloom suddenly bigger, and that love can open like a flower out of even the hardest places, then I am afraid that for you the road will be long and brown and barren, and you will have trouble finding the light. 1.63% "She was lying in bed in the uniform gray darkness of her small attic room when in one corner the shadows seemed to crimp, or flex, and suddenly standing next to her wobbly desk and three-legged chair was a person about her height. It was as though the darkness were a sheet of raw cookie dough, and someone had just taken a cookie cuter and made a child-sized shape out of it." 3.91% "She liked the word ineffable because it meant a feeling so big or vast that it could not be expressed in words. And yet, because it could not be expressed in words, people had invented a word to express it, and that made Liesl feel hopeful, somehow." That was fast. ;) That cover is so beautiful, btw. I'm so glad that you loved it. It's the most gorgeous ARC I've ever seen, Maja, so I imagine the finished copy will be even more so. It has deckled edges, raised dark gold accents, and it's wonderfully illustrated with pencil drawings inside. I marked so many pages with Post-It notes with wise, beautiful passages that I wanted to remember, Laura--the writing just makes you want to pause and savor every word. Except the story is so much fun that you are racing ahead to see what happens next! Btw, I hope you don't mind these questions but, what does "own-dtb-tbr" ou "pn-ghosts" mean? Hah, of course I don't mind! DTB means "dead tree book," a tragically inappropriate common reference to a hard copy that I actually own, not an ebook or something I've borrowed or given away. "TBR" is "to be read' and "PN" just stands for paranormal, with subsets of the supernatural critters after that. This sounds like an utter gem! When is it getting released again? I've been hearing great reviews on this one! I can't wait to read it! It'll be out this week on October 4, SL. I've been behind on reading this, but I'm glad I did in time before release. It's wonderful, Giselle! :) And yeah, the term "DTB" is sad, but appropriate Laura. Nice review Wendy! Perfect choice for a Christmas present then. I wish I knew kids around this age. I want to buy copies for them! But I'll have to settle for buying copies for adults instead. Awesome, awesome review! Have heard so many good things! Cannot WAIT to read! Thanks HD! It's an awesome, awesome book. :) Get yourself a copy soon! I'm so happy to see that you enjoyed it too, Wendy! Did you read an ARC or a finished copy? I'm curious to see what the final artwork will look like. I read an ARC, Mocha, which was already beautiful and chock-full of great illustrations--but I can't wait to see the finished product, too. They really did everything right on this one. Oh thank you, Wendy! I am so, so picky about juvenile/middle grade books so I was very hesitant about this one, too. Although there have been a number of contemporary books written for this age group that I've enjoyed, I've never before felt as if they quite captured that same feel as the classics I loved from my childhood--so I'm very glad to finally find one that does. I am hoping that Lauren Oliver writes many more books for younger readers. Lauren Oliver seems to be such a flexible writer. I mean, she writes for all different genres/ages. She is. I'm hugely impressed by this one--I liked Delirium, but I love love love Liesl & Po. There's so much heart in it. I'll definitely check this one out. Thanks from me as well. My pleasure! I hope you two enjoy it as much as I did. At the beginning of this right now. Glad to hear it's good. I like it so far. I'm excited for everyone to read it! :) Can't wait to read your review, Kaye. I hope you write a review, Aly--I'd love to read it! And it's good to spread the word. I hope you write a review, Aly--I'd love to read it! And it's good to spread the ..."
This review is GORGEOUS, Wendy. Your words are giving me shivers. Sandy wrote: "This review is GORGEOUS, Wendy. Your words are giving me shivers." Aw, thanks so much, Sandy. I just hope people find this book and hug it tight. What a beautiful review! Between you and Maja, you are killing my bookshelves! Your enthusiasm for these books is contagious and it makes me so anxious to read them! This one is no exception. Oh, thanks so much ladies! I've had a lot of luck with books lately (and so has Maja, I know), so I've been really happy. Great review. I'm glad you loved this one! And you pulled out my favorite quotation, which I think I put in a status update way back when I was reading this -- the "ineffable" one. Such beautiful language. Yes, I had to add the quote to the GoodReads library as soon as I read it! The language made me swoon--I just loved this. It took me completely by surprise. I hope you write a review, Crow! Thanks Jessi! It's a book absolutely brimming with love and magic. I hope you get a copy soon, it should be out in stores tomorrow. I keep meaning to write a review, Wendy, but I'm so behind. I read this to do a Booklist review (a library review journal) and sometimes after I write that, I can' make myself write another one. But I will work on catching up! I know how it is to be buried, though. I have a number of ARCs staring reproachfully at me as we speak. But I still have to juggle my "need to read" with "want to read" or else I won't read at all. I can't wait to read this again now! Beautiful review, Wendy! The illustrations look gorgeous! Lauren Oliver's words always go straight to my heart. Thanks Laura! I do believe it's my very favorite book from this year. I'm sure it's going to end up being a classic, and deservedly so. That's incredible. I must read this STORY! Thanks Wendy!! Added it to my list and will be looking for this book at BN when I go this weekend!! :) Awesome review, of course! Thanks so much Miakoda and Jenn! I can't wait for everyone to read this book. It will transport you to such a happy and magical place.